Press release from the Mayor of the City of Fairfax, Virginia, Honorable John C. Wood dated May 5, 1964. In this document Mayor Wood officially welcomes George Mason College to the City of Fairfax, complimenting its fine leadership and high standards. He also describes the contributions that the City of Fairfax has made toward Mason's development. 8.5" x 11"; typescript. One page. 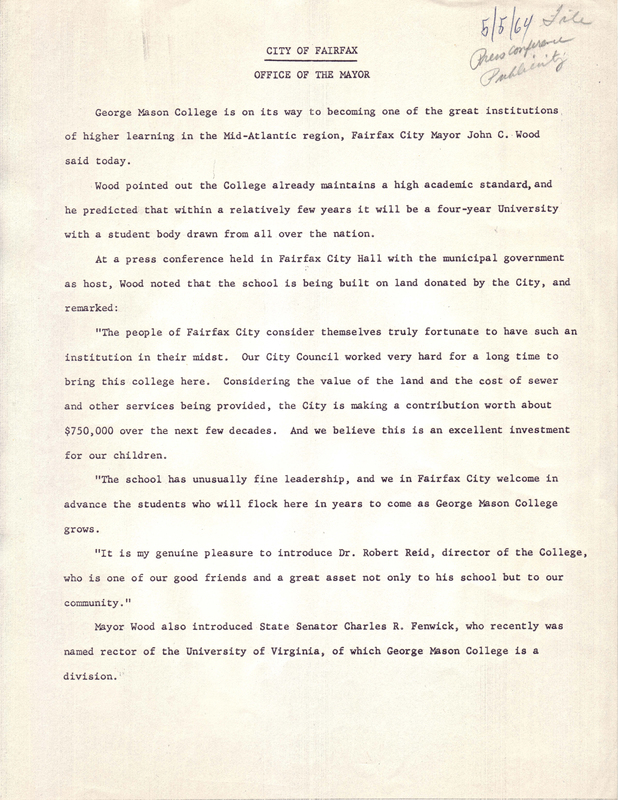 Citation: City of Fairfax, Virginia, “Press release: City of Fairfax, Office of the Mayor, May 5, 1964,” A History of George Mason University, accessed April 21, 2019, http://ahistoryofmason.gmu.edu/items/show/313.